Oct 4 2013 SRUC’s Animal Behaviour and Welfare Team hosted a one day conference (“New developments in animal welfare research”) showing some of their exciting and innovative research. Dr. Dale Sandercock prepared a flyer on his intented research for the FareWellDock project. FareWellDock is a three-year research project which is part of the Animal Health and Welfare (ANIHWA) ERA-net initiative. The ANIHWA ERA-Net aims to increase cooperation and coordination of national research programmes on the health and welfare of farm animals. The general aim of the FareWellDock project is to supply necessary information for quantitative risk assessment and stimulate the development towards a non-docking policy in the EU. The project is led by Professor Anna Valros at the University of Helsinki. The other partners in the project include Scotland’s Rural College (SRUC), Newcastle University, INRA (France), Aarhus University (Denmark), Wageningen UR Livestock Research (Netherlands), SLU (Sweden) and the Norwegian School of Veterinary Science. 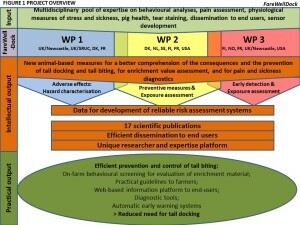 The research concerns the hazards related to using tail docking as a preventive measure in comparison with the hazard of being tail bitten, as well as on solving some of the main risk factors of tail biting: lack of enrichment, health problems, and delayed detection of an outbreak. In particular new animal-based measures are studied for a better comprehension of the consequences and the prevention of tail docking and tail biting, for enrichment value assessment, and for pain and sickness diagnostics. In addition to aiding future risk assessment, this project provides information about how end users (esp. farmers) can reduce tail biting. The project has 3 work packages (WP). 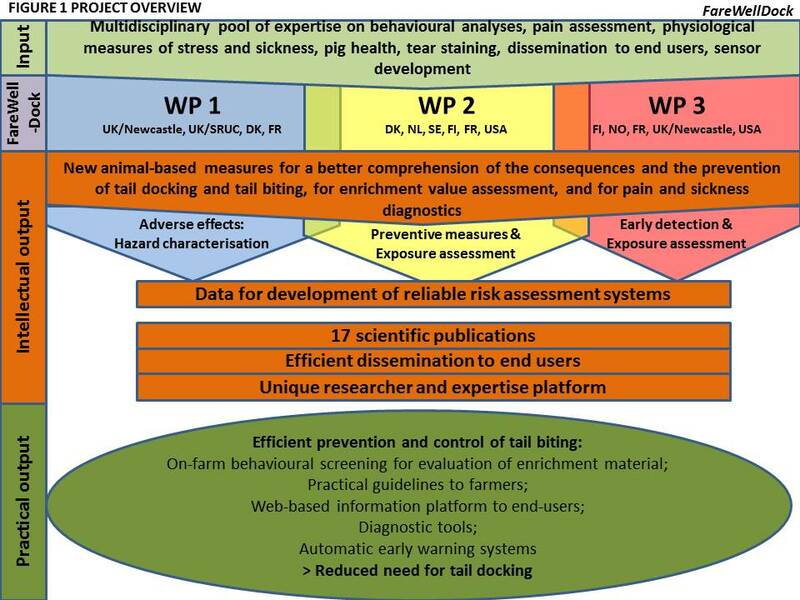 WP1 concerns pain related to docking and tail biting; WP2 concerns enrichment, and WP 3 concerns health and behaviour-related predispositions to tail biting. The WPs are coordinated by Newcastle University, Aarhus University and the University of Helsinki respectively. * To characterise the time course of traumatic neuroma development caused by tail resection. * To assess the short (acute trauma), medium (post trauma inflammation) and long term (traumatic neuroma formation) pain associated with tail docking in neonatal piglets, and the possible consequences for longer term fear of humans. At a more fundamental level, this provides a model of the effects of nerve damage (amputation) in neonates, subsequent neuroma development and its effects upon nociceptive processing throughout life. * To develop and validate a protocol for an animal-based screening method, based on exploratory behaviour and skin/tail lesions, for what constitutes a sufficient quantity of rooting material. * To explore the feasibility and validity of using AMI sensors and tear staining to measure the value of enrichment materials under farm conditions. * To test the effect of straw length, slat width and manure handling methods on pen functioning and ease of manure handling, and to describe suitable methods for implementing use of straw under commercial farming conditions. * To make scientific information on methods to reduce tail docking and improve enrichment better accessible to farmers, policy makers and the general public through the establishment of a web tool and publications in farmer magazines. * To investigate, under farm conditions, the efficiency of tail docking vs. enrichment given in sufficient quantity to reduce the occurrence of tail lesions. * To study the underlying central and peripheral stress- and immune-related mechanisms in detail to give insight into factors predisposing pigs to become tail biters or victims. Project activities related to communication include the the writing of scientific papers, giving presentations at meetings/conferences, the production of webpages, blog posts and factsheets on this website, and providing input for farmer magazines. Project summary of FareWellDock on the Eranet ANIHWA website.